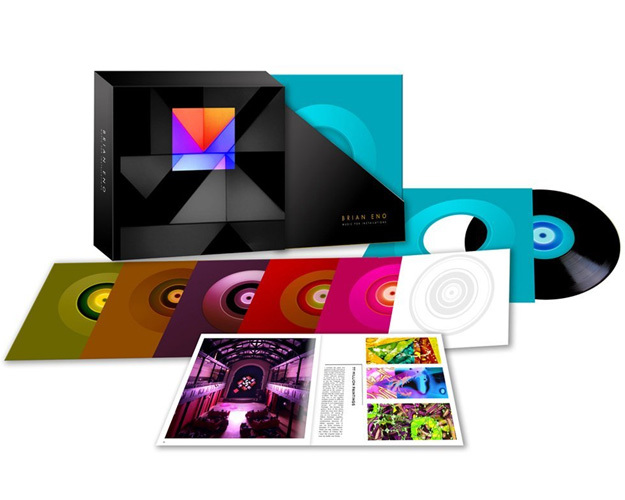 12 x 12 rigid box set of 9 LPs containing music from Brian Eno’s installations past, present and future. 64 Page book containing a brand new essay by Eno plus rare and previously unseen photographs from his various exhibitions from 1997 to the present. Each album is housed in a beautiful die-cut sleeve designed with long-time collaborator Nick Robertson and all music is guaranteed first time on vinyl. 50% of the music contained in the box set has never been available in any format and the rest has only ever had very limited cd release direct to consumer release.